It’s Tuesdays With Dorie — where a whole bunch of bakers around the world all bake the same recipe from Dorie Greenspan’s cookbook, Baking With Julia and then blog the results. 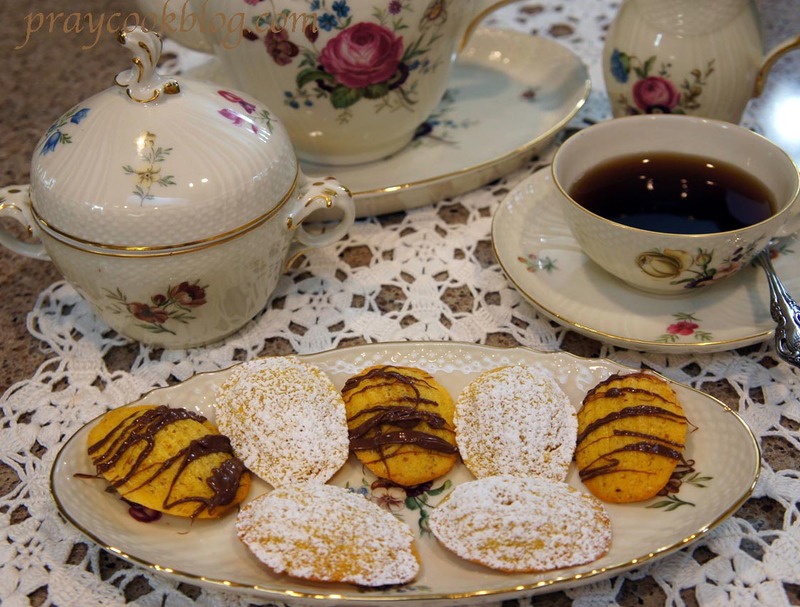 Today we are featuring Madeleines. The Madeleine (french pronunciation: ​[mad.lɛn], English /ˈmædleɪn/ is a traditional small cake from the Lorraine region in northeastern France. 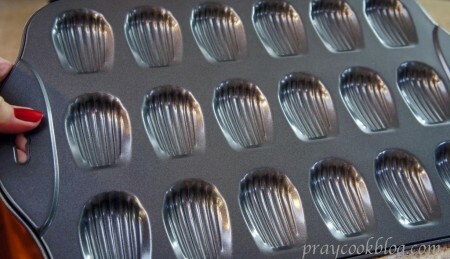 I bought my petite-madeleine pan from Amazon last year in anticipation of today’s recipe. 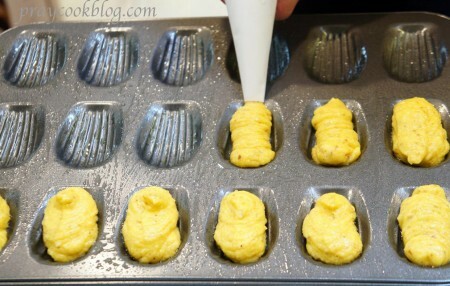 My mini Madeleine pan makes 18 small shell-shaped tea cakes. 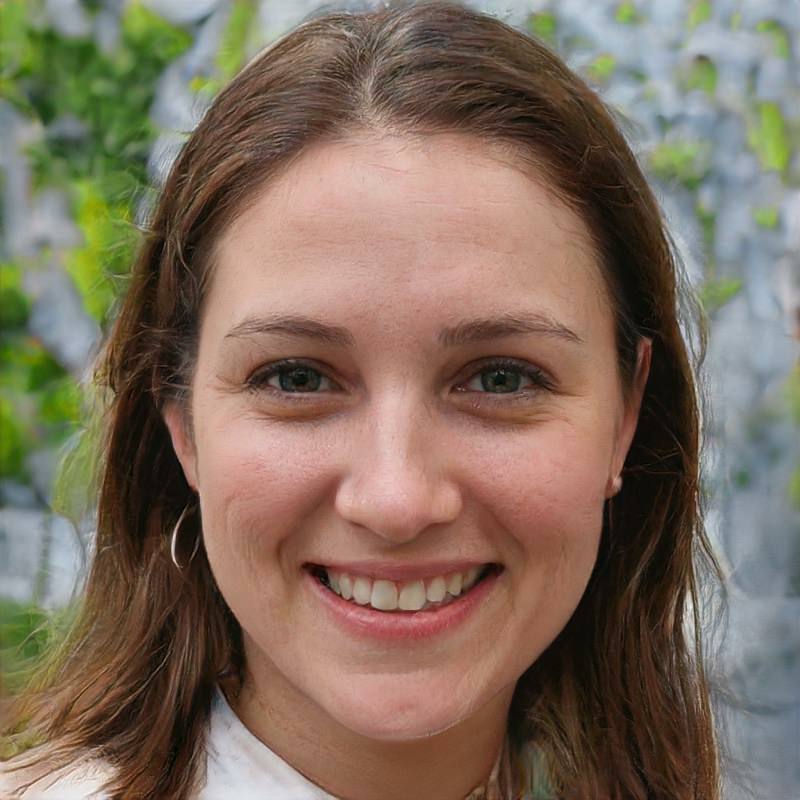 Contributing baker Flo Braker joined Julia when making Ladyfingers and Madeleines on her PBS TV show, Baking With Julia. Both of these sponge cakes use the same genoise batter. A genoise is a whole egg sponge cake. That is, it gets its lift from air retained in a whole egg and sugar mixture that is well-beaten. Our Tuesdays With Dorie hosts this week are Katie and Amy from Counter Dog. 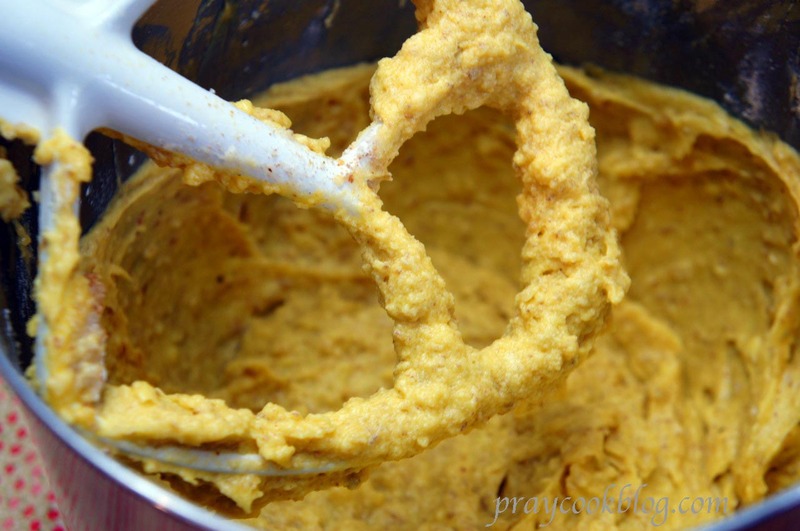 They have posted the recipe in its entirety and I hope you will check out there blog post! Meanwhile, my rebellious streak took hold of me this weekend and when I got my mini Madeleine pan off the shelf I noticed the Almond Lemon Madeleine recipe that came with the pan. Ahhhh, I have almonds, I love lemon flavor, and in a sponge cake cookie-looking thing — yes! Eggs make up a big part of the success of a Madeleine. My eggs are from a neighboring farm and much more yellow-orange than store-bought eggs. 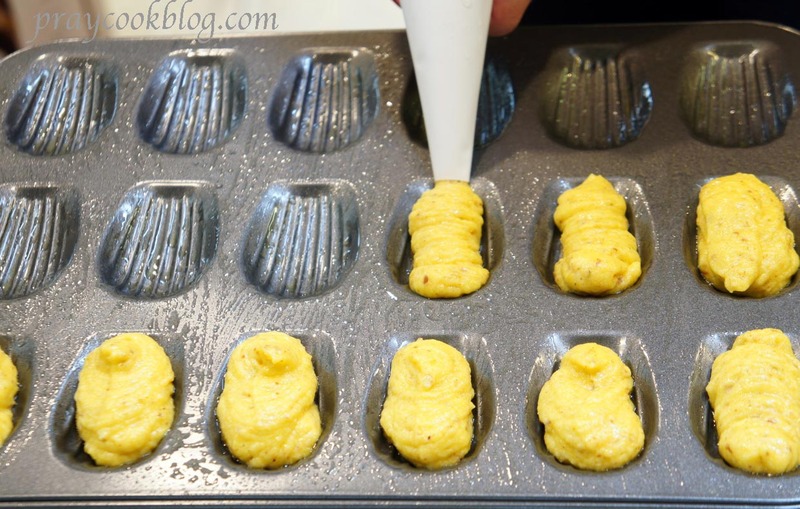 Pipe the batter into the molds for quick, even filling. If you don’t have a piping bag you can use a Ziploc bag, snipping off a corner for easy piping once it’s filled with batter. I also used a couple teaspoons and dropped the batter onto the pan to see if the little cakes baked up differently than when I piped the batter. I didn’t notice any difference. Either way they turned out great. These were baked for 8 minutes. I gently turned the pan upside-down over the cooling tray and the little sponge cakes dropped right out. French Madeleines are known by their heavy powdered sugar-coating. For my Chief Culinary Consultant I drizzled melted milk chocolate on a few. My recipe made 72 little maddies. I saved a few for the Chief and the rest will be delivered to two neighbors and one cousin! A fun recipe I will no-doubt make again. Is it a sponge cake or a cookie? You decide as you savor these delectable little treats! 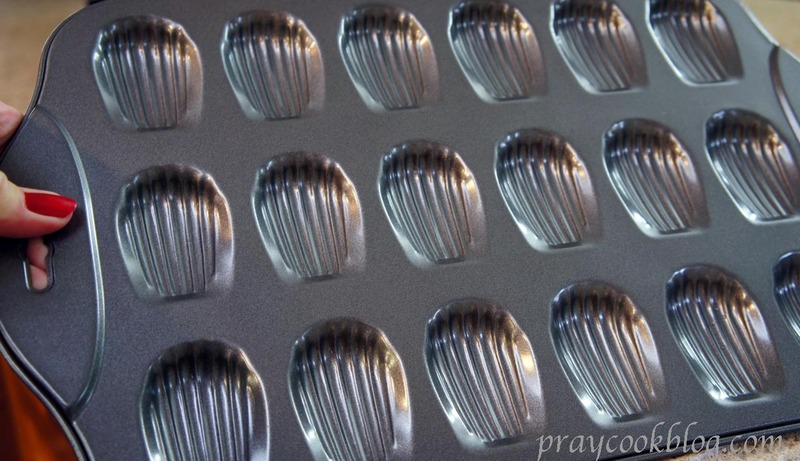 Spray Madeleine pan molds with nonstick spray. Using chopper or food processor, grind the almonds with the sugar until very fine in texture. Cream butter. Continue beating butter, adding almond and sugar mixture gradually. Beat until mixture is light and fluffy. Add eggs, one at a time, beating until completely combined with other ingredients. Add in lemon rind. In a separate bowl, sift the flour, baking powder, and salt together. Add flour mixture to butter mixture, alternating gradually with lemon juice. 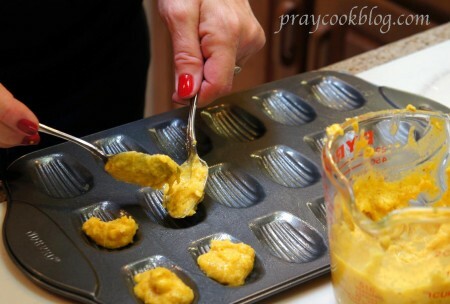 Spread batter into the molds of Madeleine pan or petite-madeleine pan. This can be done by piping into the mold or dropping by teaspoon. Do not over-fill each mold. Bake in the lower third of the oven for 8 minutes. 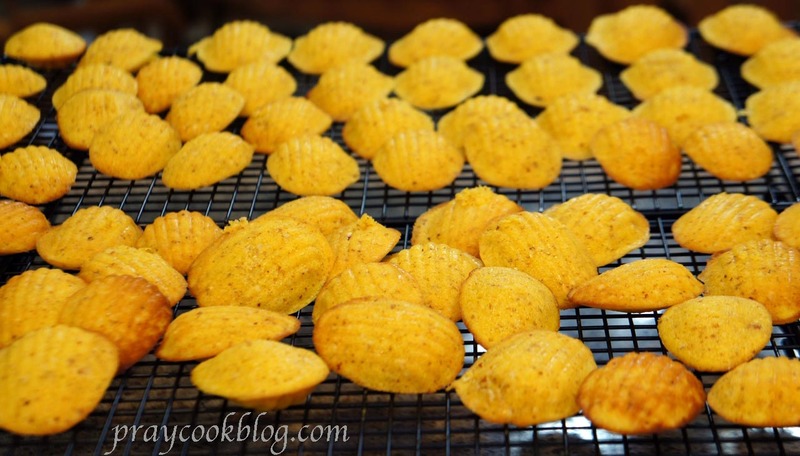 Turn Madeleines onto a cooling rack. Wash and dry pan and repeat process. Makes 4 pans full or 72 cookies. Garnish with confectioner's sugar or as desired. The Baking With Julia recipe just seemed too bland to me too! Maybe you will have time to try this one. Thanks for stopping by. I love the almond-lemon flavor combination. Thank you so much for the alternative recipe! I found the plain ones a bit boring. Your mads look amazing – I especially like the ones drizzled with chocolate. Nice flavour variation! I’ve made madeleines twice now – once for this group and once for French Fridays. I might have to invest in a proper pan for next time. And now that I have the pan I feel like I need to make them again — just to use the pan! ha! ha! Your version sounds delicious. I wish my pan had been non-stick – had to pry the little buggers out. These were not awesome enough for me to by a new pan, though tempting with your recipe. What a great gift! Good china sets can be so hard to find. 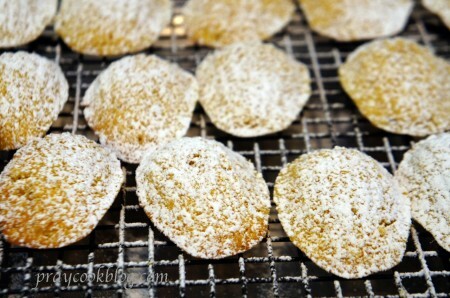 Catherine, what a nice recipe for almond/lemon madeleiens and they came out looking pretty and picture perfect. Creative idea also to add that drizzle of dark chocolate for some extra delciousness! Wow, so many madeleines 🙂 I ended up with 12 – good thing I did not decide to half the recipe…I will try your version with almonds – thanks for sharing it! Thanks! I liked your blog post even though picture perfect isn’t always necessary! Thank you! Every time I stop by your blog I want to make Rugelach again! The almonds and lemon blended well together. Some other time I might try the vanilla recipe. Thank you, they turned out better than I expected when I was piping them in the molds. Beautifully done!! Oh, do your Almond Lemon Madeleines sound good! Thanks for posting the recipe! I love anything with almonds! Thank you Tammy for stopping by my blog. I love pretty dishes and have several cupboards full so it is fun to use them in pictures! Yours look so elegant and dainty. I think I’m missing the dainty gene. I wish teapots and I could get along. At any rate, I like your additions — they sound like a significant improvement on an otherwise boring recipe. I am glad I bought the mini-pan, they are large enough! Thanks, my Chief really liked them best! I love the chocolate drizzles you did! I love the chocolate drizzle! 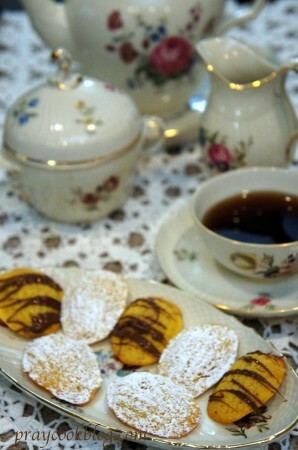 Your madeleines look wonderful. I want a mini pan too! 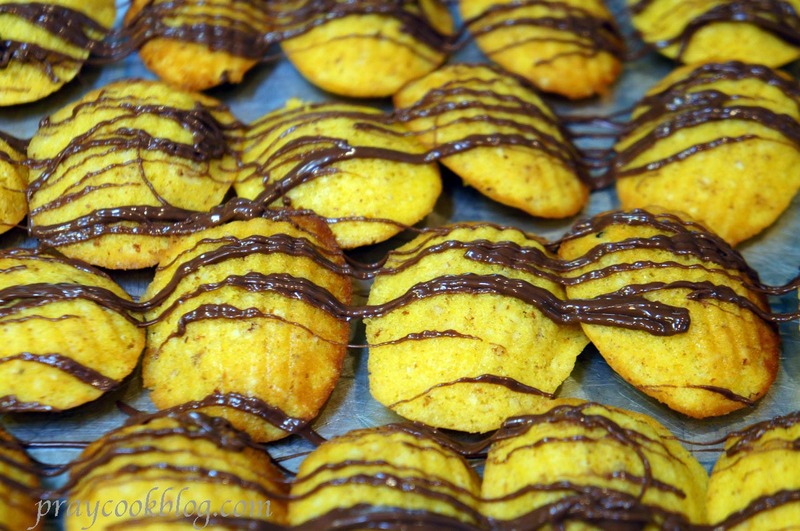 Wow your Madeleines look amazing. Wow beautiful tea set, and beautiful looking madeleines! I also liked the petite madeleine pans I’ve seen in the shops. 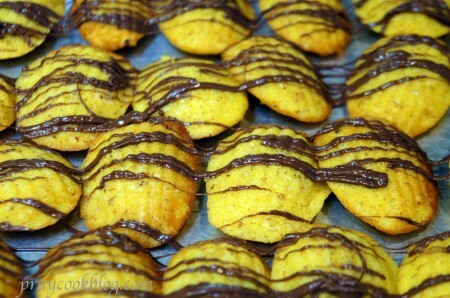 Your madeleines look perfect!!!! Mine were not so beautiful!